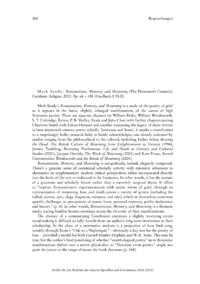 Mark Sandy: Romanticism, Memory, and Mourning (The Nineteenth Century). Mark Sandys Romanticism, Memory, and Mourning is a study of the poetry of grief as it appears in the latest, slightly enlarged manifestations of the canon of high Romantic poetry. There are separate chapters on William Blake, William Wordsworth, S. T. Coleridge, Byron, P. B. Shelley, Keats and John Clare with further chapters pairing Charlotte Smith with Felicia Hemans and another examining the legacy of these writers in later nineteenth century poetry (chiefly Tennyson and Yeats). It marks a contribution to a surprisingly bulky research field, as Sandy acknowledges, one already activated by studies ranging from the philosophical to the cultural, including Esther Schor, Bearing the Dead: The British Culture of Mourning from Enlightenment to Victoria (1994), Jeremy Tambling, Becoming Posthumous: Life and Death in Literary and Cultural Studies (2001), Jacques Derrida, The Work of Mourning (2001) and Kurt Fosso, Buried Communities: Wordsworth and the Bonds of Mourning (2004).